April 13, 2010 April 13, 2010 mintleaf9Leave a Comment on Happy Songkran! 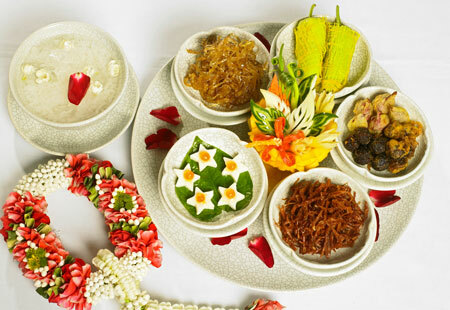 April 13th marks the beginning of Thai New Year celebrations. It is generally celebrated between April 13th and 15th; however, up north like Chiang Mai, celebrations can be up to 6 days. Songkran is basically a giant water fight. Thais greet each other by saying “สวัสดีปีใหม่” (sawatdee pimai) during this time. People splash water on each other to bless each other. It’s also a very hot time of the year so the water fights are quite refreshing. Many foreigners flock to Thailand this time of year to participate. Many head straight to Khao San Road super soakers in hand to celebrate. Dabbing white chalk on people has also become custom. Monks generally would mark you with chalk to bless you. Songkran is a big party for the Thai people. It can also be a bittersweet time as Thailand suffers many, many deaths during Songkran due to drunk driving. Thais just party too hard and get behind the wheel. Every year there are numerous public announcements urging people to celebrate safely. In 2009, according to the Nation (Thailand’s English newspaper) there were 373 deaths and 4,332 injuries that occurred due to the 3,977 traffic accidents around the country. Also, there has been a cloud over Songkran’s festivites since 2009 due to the actions of Thaksin Shinwatra, Thailand’s former prime minister who was ousted via bloodless coup. He is a fugitive living in exile with the millions and millions of dollars he stole while prime minister. He is currently inciting violence via the red shirts in Thailand. He wants to return to power and change the entire government system, ending a constitutional monarchy. He is a god to the poor people in Thailand because he promises them welath and prosperity. He has basically bought their support. When I was in Thailand in 2004, while he was still prime minister, he promised that he would end poverty in Thailand within 3 years. And there were enough foolish people to believe him. Though Songkran is a time for the streets to be soaked with water, it is instead stained with the blood of fellow Thais killing each other because of one man. We can only hope peace returns to Thailand, but definitely not before more blood is spilt.